No OC can start out with shikai already in place, let alone bankai. You must develop your character up to this. Bear in mind that all human beings (and souls) have both strengths and weaknesses. Make sure you include both. Please, don’t present us with some supercharged OC that can somehow destroy everyone. This is not acceptable. Spelling and grammar do count, but the moderators will show mercy for typographical errors and minor things. We want this to be about pretendy fun times, not who is the best English major. Age is required due to the adult nature of some private scenes that may take place. It’s also nice to know the age of the individual so we can consider that when handling you. We’re aware that some adolescents are more mature than some adults, but they’re still at a different developmental level. Knowing yours will help us keep things fair. Keep your backgrounds and physical appearances (including height and weight) within fairly realistic boundaries. Glance over the statistics of the characters in the series to get an idea of this. Along with this, consider the culture you are dealing with. This show is based in Japan, so you should monitor the cultural norms to an extent (especially if choosing to play a human). Ichigo, for example, has a different color of hair and is harassed for it. Please research the aspects used for your character. You want your character to have a mental illness? Research the actual symptoms and basic pathophysiology so you can play it properly. This applies to careers and other aspects, as well. With this, please remember that not everyone who had a rough past is constantly whining and suffering over it. Rukia and Renji are good examples. While having the past affect your character in a significant way isn’t a bad thing, constantly being melodramatic and angsty will not endear them to anyone (IC or OOC). Make yourself familiar with some of the common Japanese terms used throughout the series. You should know what “shikai,” “bankai,” “zanpakutoh,” and “shinigami” mean. Other terms will very likely be used during Rp, as well as some Japanese phrases. This is just a preference of some players. If you don’t understand something, ask. Please remember the IC (In Character) and OOC (Out Of Character) line. We are not our characters. Our characters are not us. If someone’s character yells at yours IC, that does not mean they are yelling at YOU, the player. Along with this, you’ll also need to remember that IC actions have IC consequences. You had your character disrespect a superior officer? That character will have to accept the consequences of such an action, no matter how severe. - Side note on this: Please be aware of the social structure of the grouping you’re applying for. The shinigami have a bit of a militaristic structure, so you should pay attention to this. How strictly it is enforced will vary based on the division and rank. 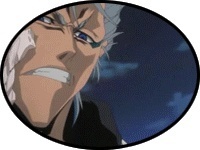 The arrancar have a different system, etc. This will be essential for your character to survive.